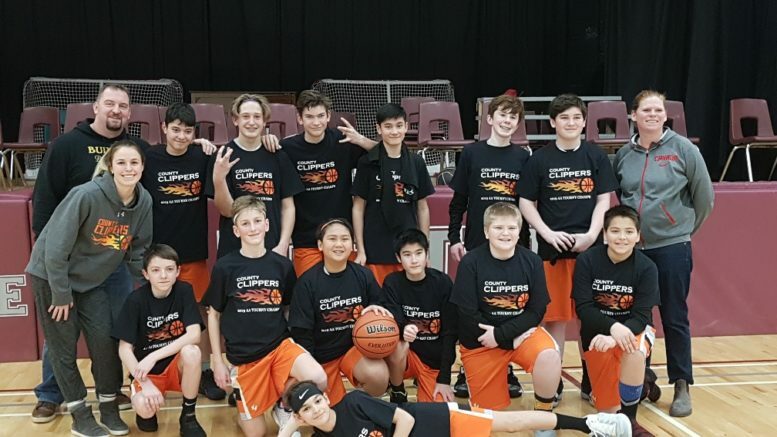 The Prince Edward County Clippers U14 Boys competed in the 5th annual County Classic Tournament this past weekend hosted at PECI and enjoyed a home court advantage en route to a championship. The eight-team tournament consisted of both double-A and single-A teams from all over the province and the Clippers started their path to the finals by playing the AA Belleville Spirits on Friday afternoon. With a previous loss earlier in the season to Belleville team, the locals were ready to show the Spirit what they were made of and downed the opposition 55 – 40. Stephen McGuey led the way for the Clippers by hitting five buckets from beyond the arc and registering 15 points. On Saturday morning the Clippers drew the early game and played the AA Kingston Impact. It was a tough game with many lessons learned and a new appreciation for the offensive and defensive drills they had been working on so far this season as the Clippers lost 73-36. The setback didn’t dampen the team’s spirits however as the host club went on to beat the AA Ottawa Shooting Stars later that afternoon 63-36.
Cooper Facette-Grondin as top scorer, pouring in 14 points. Having secured a spot in the AA finals on Sunday, the boys once again were matched up with the AA Kingston Impact and were looking for revenge. In the final, the Clippers employed a new defensive strategy which gave the Impact team fits of frustration. The energy from the bench was contagious and George Walcott was instrumental to the club’s success with his consistent defensive pressure. With less than a minute to go in the game, Kingston tied the game up at 53-53. With 53 seconds left in the contest and overtime looming, a defensive rebound by Kieran Young allowed Hayden Blakely to carry the ball down the court and put the Clippers ahead up by two points. The score would stay 55-53 as the Clippers were crowned champions. Next up for the U14 squad are a pair of league games on Feb. 2nd vs the Toronto Nets and Guelph Knights. The club wishes to thank Sobeys, Metro and No Frills of Picton for their generous donations to the team’s canteen.